Methane is 86 to 105 times as powerful as carbon dioxide at disrupting the climate over a 20-year period. The EPA and many news organizations misreport the real power of methane by using old science since updated by the Intergovernmental Panel on Climate Change (IPCC). Obama’s new rules calculate that methane is 25 times more powerful than carbon dioxide over a 100-year timeline. However, this ignores the fact that methane is most potent when it is first released. Scientists say that methane could push the climate over a “tipping point” in the next 18-25 years, causing runaway global warming, and making a 100-year timeline obsolete. In order to take the threat from methane seriously, we must join the IPCC and assess methane’s threat on a time scale that makes sense in the context of avoiding catastrophic climate change. 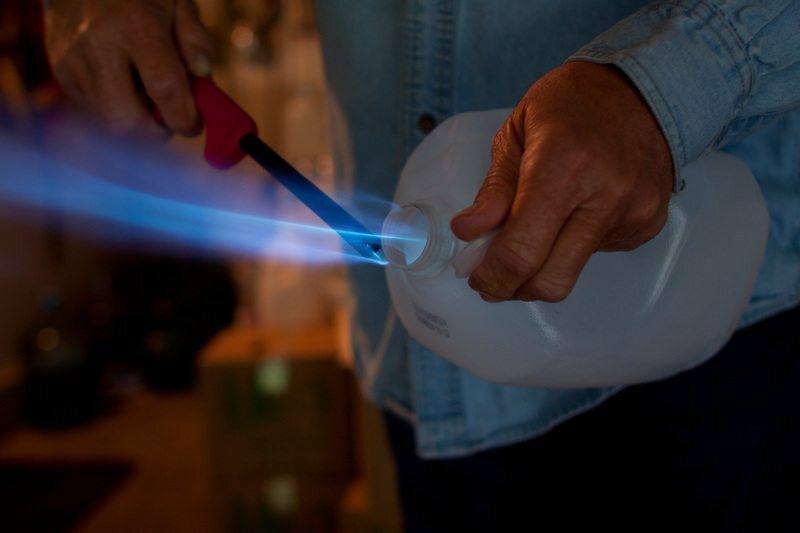 Craig Sautner lights a plastic jug of water from his well on fire. Methane from nearby hydraulic fracturing natural gas drilling has contaminated his water supply. It is undisputed that the oil and gas industry is the largest industrial emitter of methane. A recent study of the major gas producing shales found that the Barnett Shale around Dallas was leaking the equivalent of 16 coal plants worth of greenhouse gases every year. Similar studies from Colorado found that highly fracked areas leaked more than 19 tons of methane an hour. But we don’t actually know how much the oil and gas industry is emitting. The Obama administration’s new rules are aimed at reducing methane between 40 to 45 percent from 2005 levels. Unfortunately, no one really knows how much methane the oil and gas industry pumped into the atmosphere in 2005. The EPA figures that the administration’s rules rely on are based on numbers self reported by the industry. These numbers are almost certainly a fraction of actual total methane emissions. Recent studies that use planes to determine methane emissions from oil and gas operations have found much higher rates of pollution than the industry or the EPA will currently admit. For example, a study released this August found that natural gas gathering facilities, which collect methane from fracked wells, lose about 100 billion cubic feet of gas every year—eight times more than the EPA estimates. A Stanford report concluded that there is already about 50 percent more methane in the atmosphere than previously estimated by the EPA. The New York Times recently reported that the creator of the technology commonly used to measure methane emissions by the oil and gas industry thinks his invention is not accurate the way the industry and some research groups use it, and is missing a huge portion of the pollution actually released by the industry. These regulations are based on old science that misrepresents the impact of methane on the climate. The aim of the new rules is to reduce methane emissions 40 to 45 percent of an imaginary number—an underestimation of 2005 emissions. On top of that, they are only aimed at new sources, ignoring the nearly one million fracked wells and associated infrastructure that already exist in the United States. Real and meaningful reductions in methane must be made to reach the president’s global warming goals, and they have to be better than these. Inside Climate News has revealed that a key leader of oil and gas industry front groups that oppose new fracking regulations may have been playing both sides of the issue. In an investigation into the funding of the Environmental Defense Fund's (EDF) work on oil and gas regulation, Inside Climate News discovered that a key EDF funder had hired FTI Consulting's David Blackmon to promote fracking regulations. Unbeknownst to his employer, Blackmon is a longtime oil industry consultant who is paid to oppose regulation of the fracking industry. The funder in question is the Cynthia and George Mitchell Foundation, established by the late George Mitchell, known as the "father of fracking." George Mitchell owned and operated Mitchell Energy, the first company to combine horizontal drilling and hydraulic fracturing in the Barnett shale, which sparked the "shale revolution." Mitchell created the foundation with part of the $3.5 billion sale of Mitchell Energy to Devon Energy. The Mitchell Foundation describes itself as "a grantmaking foundation that seeks innovative, sustainable solutions for human and environmental problems." While its goals seem noble, the fortunes of the foundation and the people who run it continue to be inexorably linked to the success of the oil and gas industry. The foundation itself has more than $38 million in stock in Devon Energy. Three of George Mitchell's beneficiaries own over $21 million of Devon Energy apiece. Altogether the Mitchell Foundation and the Mitchell heirs own over one fifth of Devon Energy. One such heir is Todd Mitchell, who sat on the foundation's board for years and worked for Devon Energy for a decade. He currently runs oil and gas production companies and an investment business built on the assumption that gas will provide the baseload for electricity generation around the globe. The Cynthia and George Mitchell Foundation has funded a series of greenwashing efforts that have portrayed the shale and fracking industry as safe, clean, and reliable. These efforts include an online-based "virtual reality" well pad that makes no mention of water or air quality concerns. In fact, the "virtual well pad" does not mention any of the environmental or social impacts that communities near shale drilling experience. However, the Mitchell Foundation has also dedicated millions of dollars to groups that are trying to "green" the shale industry, like the Environmental Defense Fund. Since 2012 the foundation has given over $1 million to EDF. The funding was for studies of methane emissions from the fracking industry. These studies, which have been criticized as incomplete, are built on a base assumption that the drilling can be done "right." They have also led to some of the first federal regulations on the shale industry, including the methane regulations announced by the Obama administration in early 2015. The foundation also gives to a range of environmental groups, some of which are strongly opposed to fracking and oil and gas development, like the Tides Foundation and the Sierra Club. Fracking has been shown to pose a serious threat to the climate, given that methane, natural gas' primary component, traps 86 times more heat in the atmosphere than CO2 does. Blackmon and FTI Consulting's anti-regulatory and pro-fracking work constitute a potentially major undisclosed conflict of interest. Marilou Hastings, the communications manager for the Mitchell Foundation, admitted to Inside Climate that before settling on FTI, she approached and was turned down by "more than a dozen consulting firms" due to conflicts of interest. When she approached FTI Consulting and Blackmon, they not only accepted the job but failed to reveal their anti-regulatory work to Hastings. Inside Climate News writes that Hastings "didn't know of FTI Consulting's ties to anti-regulatory efforts." Furthermore, at the same time that Blackmon was being paid by the Mitchell Foundation, Energy in Depth, which is run by FTI Consulting and boasts Blackmon as a "field director," attacked the very studies Blackmon was paid to promote. All the while, Blackmon was using his position as a contributor to Forbes to promote the Mitchell Foundation's work without disclosing his financial incentives. This potentially violated Forbes' conflicts of interest clause. This raises the question: Did David Blackmon use his position with the Mitchell Foundation, in which he was tasked with promoting regulation, to feed information to his colleagues at FTI Consulting, which is paid to oppose regulation? Fracking companies had extensive influence over a critical study of the groundwater impacts from fracking, according to insider documents released by Greenpeace. In 2010, amidst growing worries about the environmental impacts from fracking, Congress compelled the EPA to conduct a study. The study was supposed to be a definitive look at the issue, exploring if and how fracking contaminates groundwater supplies. That study was supposed to be released in 2012, but has been delayed until 2016. Documents released as part of Greenpeace investigation have found that the EPA was forced to rely on shale companies like Chesapeake Energy for data, funding, and access to fracking sites. The shale industry in turn constrained the study, limiting what could be studied and when. These constraints led to the eventual cancellation of perhaps the most important part of the study - the "prospective" section. Step one: using a rhetoric of collaboration and “non-adversarial” relationships, the industry effectively establishes inside access to what otherwise should be an independent research process. This allows the industry to meddle with study methodologies, pick and chose its own favored experts, and distort findings. Step two: through inside access, the industry affords itself the authority to contest, after the fact, any findings that it is not able to water down on the front end. Step three: this access also allows industry the ability to impose infeasible methodological demands on the agency, slowing the process to a crawl and at times forcing the agency to give up trying to get answers to certain key questions. This Pennsylvania resident's water changed color and taste after a fracked well was placed near her property. Chesapeake only allowed for baseline sampling after the fracking wells had initially been drilled, rather than beforehand, as EPA scientists preferred. Without having baseline data pre-drilling, the industry can claim that contaminates existed there before their drills pierced the aquifer. The Industry has claimed this in multiple cases where groundwater impacts from fracking have occurred. Chesapeake demanded the EPA reduce the depth of their study from 300 to 150 feet, and demanded that the EPA focus solely on the fracking stage, not drilling, completion, or other stages where contamination can occur. API and ANGA tried to have their own consultants shadow the EPA's scientists during the study. This proved to be distracting to the scientists conducting the study. At the same time, Chesapeake and Range, the two companies that were supposed to cooperating with EPA on the prospective study, were attacking other EPA studies of water contamination cases. While initially finding evidence of contamination from Chesapeake Energy wells in Pennsylvania and Range Resources wells in Texas, The EPA never pursued any regulatory action. Chesapeake was, as one EPA email put it “part of the team here” when it came to the water study. As Neela Banerjee writes in Inside Climate News: "The industry balked at the scope of the study and sowed doubts about the EPA's ability to deliver definitive findings. In addition, concerns about the safety of drinking water conflicted with the Obama administration's need to spur the economy out of recession while expanding domestic energy production." Does Fracking Contaminate Water Supplies? Studies conducted since the EPA’s study began have found evidence that fracking affects groundwater supplies. A 2013 Duke University study found that within a kilometer of fracking wells, methane concentration in drinking-water wells was 6 times higher than the surrounding area. A University of Texas-Arlington study from 2013 found elevated levels of arsenic and heavy metals in groundwater near fracking sites in Texas’ Barnett Shale. See Greenpeace's fracking page for a list of groundwater contamination incidents. Last week in Washington DC, Maryland Governor Martin O’Malley’s political dark money group met with corporate funders at the DC headquarters of the American Natural Gas Alliance (ANGA). ANGA is the lead lobby group for the fracking and shale industry, with a budget of $69 million in 2012. O’Malley’s group is called newDEAL, which describes itself as a “national network searching the country for state and local elected leaders who are pro-growth progressives to help them share their innovative ideas.” I found out about the meeting when I was forwarded an invitation. When I replied to a RSVP, I was initially sent a welcoming “see ya there” from Lauren Wessler, the organizer for the event. Wessler works for Helen Milby, who runs HM&CO, a fundraising group that connects corporations with legislators. Her work has been described as “To communicate behind the scenes with power brokers in government and in the corporate world, and create events so that they can come together to make exchanges of money and influence.” O’Malley created newDEAL with Alaska Senator Mark Begich, and the group is co-chaired by democratic politicians Cory Booker, and CO Governor John Hickenlooper. They bill themselves as “pro-growth” democrats, but an expose by Lee Fang in Vice revealed that newDEAL was funded by some of the largest corporations in the US, the same corporations that provide the majority of funding to republican politicians. newDEAL funders include Comcast, Fluor, Merck, Microsoft, New York Life, Pfizer, Qualcomm, Verizon, Wal-Mart, the Private Equity Growth Capital Council, among others, including, of course, the host of Tuesday's event, ANGA. Given the corporate connection, the newDEAL is an attempt to grow O’Malley and company’s political war chests with corporate dollars, more “deal” than “new.” A few hours after receiving confirmation of my RSVP, another email buzzed into my inbox from Lauren. Apparently she had made a mistake. “The room seats less people than I originally thought…So sorry,” read her retraction of my RSVP. Sounds fishy, but OK. Maybe there just isn’t enough space at the largest fracking lobbyists’ headquarters for a researcher from Greenpeace. But there are always those people who RSVP and don’t show, so I went to ANGA the day of the event, just in case they could squeeze me in. The O’Malley connection to ANGA is particularly interesting given the battle the gas industry is waging in his state. Fracking is still being studied in Maryland, and drillers have not yet started exploiting the shale that lies under parts of the state. Maryland is also home to Cove Point, a proposed Liquified Natural Gas export plant. The plant will be the 3rd LNG export plant fully permitted in the US according to most analysis. Cove Point was just conditionally approved by FERC, which just released an Environmental Impact Statement. FERC’s statement has been roundly criticized for missing key elements, such as climate impacts, community safety, marine impacts, and fracking. Big money is troubling; secret money is toxic. Having millions of dollars from outside groups pumped into elections distorts the democratic process. Not knowing what interests are behind those millions magnifies that distortion. The Center for Responsive Politics estimates that the 2012 election saw more than $250 million in political spending by nonprofit groups organized under 501(c)(4) of the Internal Revenue Code, up from $86 million in 2008 and $3 million in 2004. Wonder how many of those millions was from the shale industry, looking to open Maryland for drilling? Or Wal-Mart, trying to erode minimum wage? Or Wall Street making sure limits on risky banking will not be enforced? In North Carolina, Halliburton and other fracking industry interests helped write a fracking chemical disclosure bill. But when that bill ended up requiring disclosure of harmful chemicals to the state environmental agency, the bill was killed and replaced with one that further limited disclosure of the chemicals used in fracking. A cache of emails obtained by Greenpeace has revealed the cozy relationship between the hydraulic fracturing industry and North Carolina’s Mining and Energy Commission. The Mining and Energy Commission (MEC) was set up after an errant vote by a state senator legalized fracking in North Carolina. Because the state had not seen oil and gas drilling in recent history, the Mining and Energy Commission was tasked with writing oil and gas regulations, specifically for fracking. The 15 members of the MEC propose regulations for fracking, which are then passed on to the North Carolina legislature to be turned into law. Emails and meeting schedules from members of the North Carolina’s Mining and Energy Commission reveal how various fracking companies and national lobby groups, including America’s Natural Gas Alliance (ANGA), Energy in Depth (EID), Halliburton, and Koch Industries, influenced the Mining and Energy Commissioners, in regards to disclosure of chemicals used in fracking. In an interview with AP, Mining and Energy Commission Chairman Jim Womack acknowledged that before deciding to delay the vote, he spoke with a senior Halliburton executive. “They indicated to me in a phone conversation that there may be other options than what was written in that rule,” Womack said. The bill was taken off the agenda by Womack, and sent back to be rewritten by the chemical disclosure committee. Halliburton has always cast a long shadow over the MEC. Commissioner Vikram Rao was at Halliburton for over 30 years, ultimately as the company’s Senior Vice President and Chief Technology Officer. He maintains a significant financial stake in Halliburton, and also has over $10,000 invested in BioLargo, a company involved in disposal of fracking wastewater. Documents obtained by Greenpeace also reveal that the shale industry was close with one commissioner in particular. George Howard serves as vice chairman of the MEC, and as the chairman of the chemical disclosure committee, which is tasked with creating regulations for frack fluid and other fracking chemicals. He was appointed by North Carolina’s Senate President Pro-Tem Philip E. Berger to serve in one of two “conservation” slots on the MEC. Berger received $46,700 in campaign contributions from fracking interests between 2009 and 2011. In addition to serving as commissioner for the MEC, Howard is the founder and CEO of Restoration Systems, an environmental remediation company. Through Restoration Systems, Howard has a significant financial stake in the fracking industry, including a multi-million dollar shale play project in Pennsylvania. Howard has also invested in the area of North Carolina most likely to be leased by fracking companies. Howard is connected to other top regulators, especially John Skvarla, the Head of North Carolina’s Department of Environmental and Natural Resources (DENR), who was president of Restoration Systems before becoming an environmental regulator. DENR would be the agency responsible for enforcing fracking laws recommended by the MEC. Documents obtained by Greenpeace include correspondence between George Howard and various representatives of the oil and gas industry during the creation of the first chemical disclosure bill. Howard had multiple meetings with the American Petroleum Institute (API) and spoke with high-ranking members of the American Natural Gas Association (ANGA). Howard specifically requested help from Energy In Depth (EID), an oil and gas front group run by the PR firm FTI Consulting and funded by the fracking industry. Howard asked Steve Everley, the spokesman for EID and an FTI Consulting operative, to help him prepare for a MEC meeting on chemical disclosure. Although George Howard met with and solicited information from multiple shale industry groups, one lobbyist was particularly influential. Bowen Heath, who represents Halliburton, Koch Industries, and various other oil and gas interests for the lobbying firm McGuireWoods, had unparalleled access to the Commission. Emails reveal a chummy relationship between George Howard and Heath, who spent evenings together and went for beers in the afternoons. Heath provided a fracking chemical disclosure bill to Howard that the shale industry and its political allies previously passed in Colorado. The Colorado bill was based on a model bill from the American Legislative Exchange Council (ALEC), a corporate-funded group dedicated to passing legislation approved by ALEC’s corporate funders, including fracking companies like Chesapeake Energy. Bo Heath has longstanding ties to ALEC, and has attended ALEC annual meetings. A New York Times investigation found that the Colorado chemical disclosure bill was the handiwork of one ALEC funder in particular, ExxonMobil. As part of the push for the ALEC fracking bill passed in Colorado, Bo Heath arranged for Colorado ex-governor Bill Ritter to fly down to North Carolina to meet with George Howard and the MEC. The AP confirmed that Ritter’s fees and expenses were not paid by the MEC, and Bo Heath’s lobbying group refused to comment on Ritter’s funding. Hallmarks of the ALEC fracking bill include generous exemptions from disclosure for “trade secrets,” and reliance on the FracFocus website for disclosing chemicals to the public. FracFocus’s operational costs are paid for by the oil and gas industry lobbying groups American Petroleum Institute (API) and America’s Natural Gas Alliance (ANGA). FracFocus was found to be “severely lacking” as a regulatory tool by a recent Harvard study. Heath continued to advocate for the industry/ALEC approach to chemical disclosure, and even brought in a key member of FracFocus, Mike Paque. Paque is the executive director of the Ground Water Protection Council (GWPC). The GWPC has long been an ally of the oil and gas industry, receiving funding from the American Petroleum Institute and other industry affiliates. Reports produced by GWPC are the backbone of the oil and gas industry’s claims about the safety of fracking. The GWPC also runs the FracFocus website, and advocates for its use. Taking up his drinking buddy's suggestion, George Howard selected Paque as an expert witness for the MEC. Paque presented the industry-funded FracFocus website in an unrecorded meeting on December 18, 2012. In the end, even though the bill that George Howard passed through committee was shot down by Jim Womack and Halliburton, it contained most of what Bo Heath and other industry lobbyists wanted. It used the API, ANGA funded website FracFocus for disclosure of chemicals, and exempted chemicals deemed trade secrets from being disclosed to the public on that website. However, Halliburton killed the bill because it required disclosure of all chemicals to the Department of Environment and Natural Resources. The new bill, which has passed through the MEC committee and is headed for ratification in the State House of North Carolina, included a requirement to use the FracFocus website, following the ALEC fracking model legislation passed in multiple states. And like those states, trade secrets are not disclosed the state, or the public. Which part of Obama's State of the Union was written by the oil industry? c) fracking for oil and gas can be "sustainable"
The answer is literally, "all of the above." "The all-of-the-above energy strategy I announced a few years ago is working, and today, America is closer to energy independence than we’ve been in decades." The phrase “all of the above,” which the president used in his 2012 State of the Union address as well, is the creation of the oil industry’s most powerful lobbying and public relations arm, the American Petroleum Institute (API). According to the New York Times, the phrase was introduced in 2000 by API to advocate for oil drilling. API’s position at the time was “that an effective national energy policy must, at a minimum, allow for all of the above.” API, proud of the hegemony of their ideas, actually predicted the president would champion the pro-fossil fuel message in this most recent State of the Union address, the day before the speech was given. After The American Petroleum Institute debuted the phrase in 2000, it was quickly picked up by republicans with wells to drill. John Mccain made it a central part of his 2008 campaign for president. Republicans in the house and senate used it to promote offshore drilling. The former governor of Virginia, Bob McDonnell, now under federal indictment for corruption, listed the phrase on his campaign website. This isn't just etymological trivia. The use of oil industry talking points by the president indicates how ingrained and powerful the fossil fuel industry is in the U.S’s energy conversation. It also casts a revealing light on other pro-fossil energy comments made by President Obama in the speech, like promoting “Energy Independence.” The idea is, if we allow oil and gas corporations to exploit our land and water to extract fossil fuels, it will benefit the average citizen by lowering energy prices and reducing dependence of “foreign” energy supplies. This is completely false, as Rex Tillerson, CEO of Exxon Mobil will tell you. The oil industry wants to sell it's product on an open market, to the highest bidder, no matter who that is. Currently there are plans for 25 Liquified Natural Gas export terminals in the US, and the American Petroleum Institute is spending millions of dollars to undo a decades old law that prohibits the export of crude oil. As more oil and gas is drilled from American soil and water, more gas and oil will be exported. We will continue to import oil and other goods from around the world, regardless of how much drilling happens in the U.S.
Another energy myth promoted by the Obama administration and the fossil fuel industry is natural gas as a bridge fuel to renewable energy. The truth is that gas is primarily comprised of methane, an extremely powerful greenhouse gas. Some scientists believe that methane could be up to 105 times as destabilizing to the global climate as carbon dioxide. When fully burned, gas releases less CO2 than coal or oil, but currently huge amounts of methane are escaping unburned into the atmosphere. An increase in spending on gas infrastructure, like pipelines, Liquified Natural Gas export terminals, or vehicle refueling stations, is not a bridge to renewable energy. It is the same old fossil fuel infrastructure that poses serious threats to the earth’s climate and local environments. The U.S doesn’t need more spending on fossil fuels, it needs a real commitment to renewable energy, efficiency, and cutting carbon pollution. The study was conducted in secret by NERA, a consulting company that has a history of producing industry funded studies that obscured the health effects of tobacco and coal. This particular study, which focuses on the economic impacts of exporting liquefied natural gas (LNG), was commissioned by the US Department of Energy, and will heavily influence the DOE’s decisions on the permitting of 15 proposed LNG export facilities. Because of the way that exports of natural gas are regulated, the oil industry must convince the US Department of Energy that exporting America’s fracked gas is in the best interest of the country, in order for the DOE to approve any LNG export projects. Alarmingly, the DOE kept the identity of NERA a secret from the public, and refused to answer Freedom of Information Act (FOIA) requests filed by Greenpeace, as well as requests from senators’ offices. The DOE’s excuse? According the DOE FOIA officer I spoke with, they didn’t want outside groups to “influence” the study. It was Reuters that eventually revealed the identity of NERA, weeks before the DOE publicly released the the details of the contract. Reuter’s credited “industry sources” for the information. So to recap, the DOE refused to tell the public the identity of group conducting an extremely important study on natural gas exports, citing a desire to protect the contractor from “influence,” a tacit admission that these studies are somehow corruptible. Then we find out that the notoriously unscrupulous gas industry knew the identity of the contractor before the DOE announced it publicly - the same gas industry willing to use psychological warfare techniques on rural Pennsylvanians - and it was the industry that leaked the contractor’s identity to the press. Now the study has come out, and surprise, surprise, it says everything the gas industry wanted to hear. The NERA study supports the unlimited export of natural gas, which opens the door for the gas industry to sell fracked gas in foreign markets. Not only will that lead to higher gas prices here in the US, making fracking more profitable and therefore assuring the drilling of many more wells, but it also means more natural gas infrastructure, more methane leaks, and another blow to our already fragile climate. All the while increasing the profits of oil and gas corporations, like ExxonMobil. "Across all these scenarios, the U.S. was projected to gain net economic benefits from allowing LNG exports. Moreover, for every one of the market scenarios examined, net economic benefits increased as the level of LNG exports increased. In particular, scenarios with unlimited exports always had higher net economic benefits than corresponding cases with limited exports." Considering the DOE considers NERA to be vulnerable to outside influence, and we know the gas industry knew of NERA’s study before the public did, the NERA study and its results must be questioned. When the oil and gas industry gets to write the rules supposed to govern them, public health and the public good are left by the wayside. Unfortunately that is exactly what is happening with the regulation of hydraulic fracturing in New York and other states. In New York, Governor Andrew Cuomo’s administration has been accused of conspiring with the fracking industry to develop regulations that limit the states ability to oversee fracking. Documents recently uncovered by Environmental Working Group show that industry representatives were given drafts of the state’s proposed regulations before they were released to the public. Industry representatives then used the privileged information to lobby against commonsense rules, like testing for radioactivity in waste-water. In other states, like Ohio, fracking laws written by corporate front groups like the American Legislative Exchange Council (ALEC) have already been passed. Currently, the major federal environmental laws regulating hazardous waste, air pollution and water pollution all have significant loopholes and exemptions for fracking. This is because the fracking industry has fought hard to keep regulation at the state level, where it is easier to influence and harder to enforce. As a recent report by the OMB Watch illustrates, state laws, many of which may have been written by the fracking industry, have failed to protect public health. For more on the environmental, public health, and community impacts of fracking, see Greenpeace’s recently updated fracking page. We don’t want the oil and gas industry writing the laws that are supposed to regulate them. The fracking industry does not have the health of the public in mind. As Josh Fox’s latest video discusses, the oil and gas industry continues to publicly deny that fracking leads to poisoned water wells, though internal industry documents show that they have acknowledged and attempted to address the problem (unsuccessfully). The industry has even deployed military personnel and tactics against Pennsylvanians, which one company executive referred to as “insurgents.” Frackers want cheap access to the hydrocarbons in the shale, which means externalizing environmental, public health, and community impacts. The frackers don’t care about American jobs, the economy, or “energy independence.” One of the most popular talking points used by the oil and gas industry is summed up by the bumper sticker “drill here, drill now, pay less.” The idea being if we allow oil and gas corporations to exploit our land and water to extract fossil fuels, it will benefit the average citizen by lowering energy prices, reducing independence of “foreign” energy supplies, etc. This is completely false, as Rex Tillerson, CEO of Exxon Mobil will tell you. Companies involved in fracking want to increase the price of natural gas by exporting it out of the country. They want to sell it on an open market, to the highest bidder, no matter who that is. The fracking industry’s short-sightedness hurts everyone involved, including themselves. When the fracking boom took off a few years ago, the oil and gas industry treated it like a gold rush. Companies like Chesapeake Energy put every dime they had into acquiring land and drilling wells, while taking out massive loans to finance the expansion. The frackers produced so much gas that gas prices dropped through the floor, to historically low prices. Right now, these companies are losing money and can’t even afford complete the wells they have already drilled. In Pennsylvania there are 5,000 wells awaiting completion, sitting idle, as their well casings deteriorate. Like the bankers responsible for the financial collapse, the fracking industry’s ravenous approach to drilling created a bubble, which the public will pay for with toxic water and a landscape ravaged by heavy industry.